Worth Noting: The nearby Portage Bike Trails in neighboring Portage County, add another 15 miles of paved trails. Just as the Dayton and Xenia networks are connected by trail, so too are Akron and Cleveland bikeways. The connector in Summit County is the Ohio & Erie Towpath Trail, which uses the Cuyahoga Valley National Park to bridge the gap and connect the two cities. As the towpath makes its way though the CVNP just north of Akron, a segment of the Bike & Hike runs alongside, just a mile or so to the east. 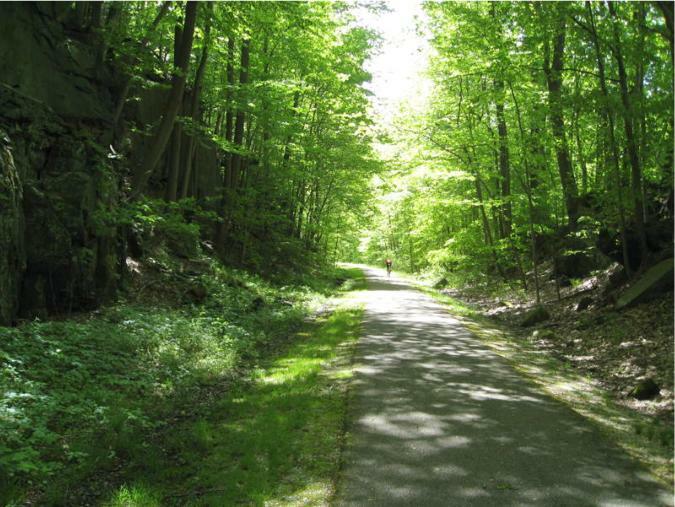 Both trails connect with the east-west Emerald Necklace Trail that crosses their path, bringing the 3 trails together in the CVNP. If you include the cross-state Ohio-to-Erie Trail, that shares the towpath here, the total is 4 trails. The 4 trails don't have a single convergence point, like Xenia Station is SW Ohio, but the bikeway mileage is significant. Though these connections actually take place between Akron and Cleveland, we'll list them here. Taken separately, the total trail miles look like this. If you plan on coming to the CVNP to ride these trails, you should know that the OTE and towpath are mostly trail, with occasional short road riding transitions between sections. The Bike-Hike and Emerald Necklace, however, have more substantial road-riding segments included within their routes. The Akron Bike-Hike Trail has also been connected with short segments of the Portage Hike & Bike Trails to the east in Portage County. Future Portage Trail connections will link 15 more miles of trail to the Akron-area trail network. Summit Bike Share serves bicyclists from Akron and surrounding areas.